CHICAGO, IL--(Marketwire - February 16, 2010) - TransUnion's quarterly analysis of trends in the mortgage industry found that mortgage loan delinquency (the ratio of borrowers 60 or more days past due) increased for the 12th straight quarter, hitting an all-time national average high of 6.89 percent for the fourth quarter of 2009. This quarter marks the first time the mortgage delinquency rate increase did not decelerate after doing so for three consecutive periods. The report is part of an ongoing series of quarterly consumer lending sector analyses focusing on credit card, auto loan and mortgage data available on TransUnion's Web site. Information for this analysis is culled quarterly from approximately 27 million anonymous, randomly sampled, individual credit files, representing approximately 10 percent of credit-active U.S. consumers and providing a real-life perspective on how they are managing their credit health. Mortgage borrower delinquency rates in the fourth quarter of 2009 continued to be highest in Nevada (16.19 percent) and Florida (14.93 percent), while the lowest mortgage delinquency rates continued to be found in North Dakota (1.84 percent), South Dakota (2.46 percent) and Alaska (2.84 percent). Areas showing the greatest percentage growth in delinquency from the previous quarter were the District of Columbia (+20.2 percent), Louisiana (+17.7 percent) and Delaware (+14.8 percent). Unlike last quarter, no state showed a decrease in mortgage delinquency rates from the previous period. The average national mortgage debt per borrower increased (0.29 percent) to $193,690 from the previous quarter's $193,121. On a year-over-year basis, the fourth quarter 2009 average represents a 0.47 percent increase over the fourth quarter 2008 average mortgage debt per borrower level of $192,789, which further suggests stabilization in housing prices, traditionally seen as a key ingredient for a sustained economic recovery. The area with the highest average mortgage debt per borrower was the District of Columbia at $372,869, followed by California at $352,688 and Hawaii at $317,599. The lowest average mortgage debt per borrower was in West Virginia at $99,028. Quarter over quarter, the District of Columbia showed the greatest percentage increase in mortgage debt (+3.63 percent), followed by Vermont (+3.03 percent) and Georgia (+2.38 percent). Areas showing the largest percentage drop in average mortgage debt were Alaska (-3.5 percent), South Dakota (-1.58 percent) and Nevada (-1.26 percent). The news was not altogether bad for the mortgage sector in the fourth quarter, as bright spots appeared at the metropolitan level. Thirty-eight MSAs (Metropolitan Statistical Areas) showed a decrease in their mortgage loan delinquency rates since third quarter. Heading the pack for improving credit conditions were Corvallis, Oregon; Lafayette, Indiana; and Sharon, Pennsylvania. This compares to only 27 MSAs that showed a quarterly decrease in delinquency last year between third quarter and fourth quarter. "At the national level, these results are in part due to seasonality effects. Consumers tend to run low on cash at the end of the year, after spending for the holidays, but before receiving year-end bonuses and tax refunds," said FJ Guarrera, vice president of TransUnion's financial services business unit. "At a more granular level, variations in delinquency highlight the fact that the recession and the eventual recovery are both regional phenomena tied for the most part to localized house price conditions and unemployment levels. It is good news that, while the median price of existing single family homes dropped almost seven percent between the third and fourth quarters of 2008, it dropped only 0.4 percent between the third and fourth quarters of 2009. We're not out of the woods yet. The continuing rise in foreclosures, in conjunction with low consumer confidence in the housing market, continues to hinder housing value appreciation and impede recovery in the mortgage industry. Furthermore, there is wave of adjustable rate mortgages (ARMs) that have yet to reset. Many of these are Option and Alt-A loans. When the interest rates on these loans reset many consumers potentially will not be able to meet their debt obligations. "We are now facing the challenge of achieving consistent growth in home sales and thereby improving home values," added Guarrera. "Even with the introduction and extension of multiple tax incentives available to both home buyers and sellers, home sales decreased in December of 2009. As the unemployment rate is expected to hover near 10 percent for the remainder of 2010, consumer spending will likely remain tepid." 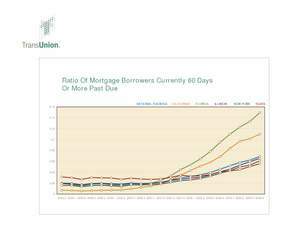 TransUnion's 60-day mortgage delinquency rate forecast made at the beginning of the year fell in line with year end 2009 actual results -- falling short by only 2.5 percent. TransUnion's forecasts for 2010 are slightly more pessimistic than before due to questions concerning house price appreciation, the continued high level of unemployment, and the potential eroding of consumer confidence as the effects of the government stimulus begin to fade. "We believe that the 60-day mortgage delinquency rate will peak between 7.5 and 8 percent over the course of 2010, depending on the prevailing economic conditions associated with the housing market," said Guarrera. The source of the underlying data used for this analysis is TransUnion's Trend Data, a one-of-a-kind database consisting of 27 million anonymous consumer records randomly sampled every quarter from TransUnion's national consumer credit database. Each record contains more than 200 credit variables that illustrate consumer credit usage and performance. Since 1992, TransUnion has been aggregating this information at the county, Metropolitan Statistical Area (MSA), state and national levels.